3BR/2BA Oceanside Village The Keys Section. New carpet and upgrades 2017. In Oceanside Village, an 144-acre community with 24-hour security. Complex offers two pools [one indoor], hot tub, kids water park with louge area, tennis courts, softball field, playground, and activity center. toilet, tub, shower, Garden tub and separate shower. Double sinks in master. 3 blocks to the ocean and private beach front front parking . Golf Cart is included. Indoor and outdoor pools, kids water park, volleyball court, tennis courts, hot tub and ball field. Oceanside Village 3 blocks to the ocean. Linens will be are provided for use at no charge but you will need to wash and dry towels. Bed linens may be left clean in washer dryer and cleaning crew will remake beds. Parking in driveway for 3 cars. Share internet with our other rental next door. Towels are available at no charge. Due to long drying time towels must be washed and dried before check out. Available for a fee at community center. New Carpet prior to 2017 season. Seating for 8 in dining room additional bar stools for 2 in den. New carpet 2017. 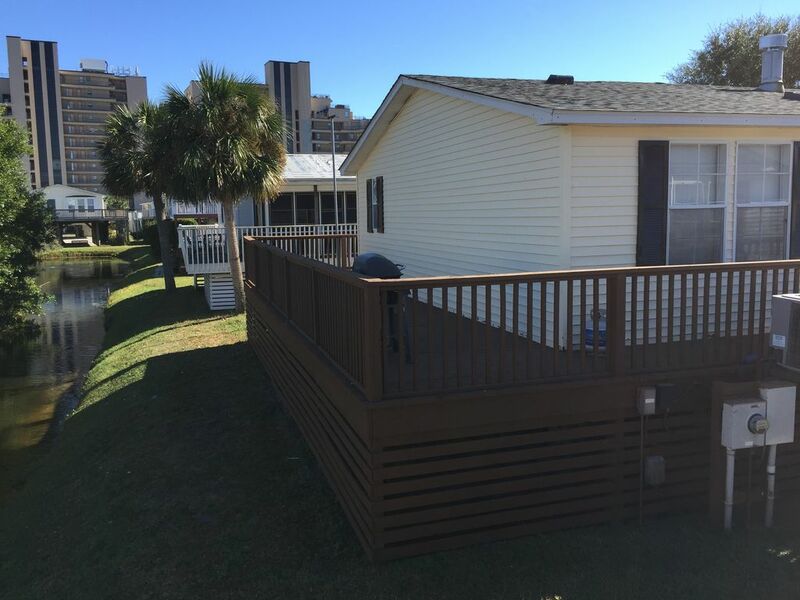 Wrap around deck on waterway. (fresh water) Feed the ducks and turtles. NO SMOKING in unit or in the doorway to the unit. Smoking only allowed on back deck of property. No singles under 25 unless part of family with parents staying in the same house. Excellent place to stay for a family vacation! Beautiful home with plenty of room for our family of 11. Ms. Beth was always quick to respond to my text messages before and during our stay in her home. Oceanside Village has lots of things for the kids to do, and the home is really close to the ocean. The golf cart that is included with the rental was an added bonus. We thoroughly enjoyed our stay! Loved it!! Will definitely be back! Beth’s home was lovely and would rent from her again. The house was perfect for my family, loved the deck at the back also on the creek with the turtles. Great Location, Helpful Owner, Overall a great Time. We stayed here for a week with two families (3 adults and six children). The location of the house was great-a short golf cart drive or walk from the beach. The house was spacious and cute but definitely in need of some upgrades and renovation. The owner was quick to respond though and helped us with any issues we had immediately. She even ordered a new bed spread and sheets upon realizing the older ones were torn. The kids had a blast feeding the turtles and ducks in the canal off the deck. The neighborhood was peaceful and quiet and we didn't have any trouble getting in and out of the gates. The kids loved the mini water park at the outdoor pool and the indoor pool was a great place to relax after a day at the beach. We would definitely stay here again as it was a great price given its proximity to the beach and pools. Thanks for taking care of our beach house. Glad your family enjoyed your vacation. Thanks for already booking for 2019.